Samsung Galaxy Note 9 in Depth! : A Visual and Detailed Guide to Using Your Note 9 Like a Pro! 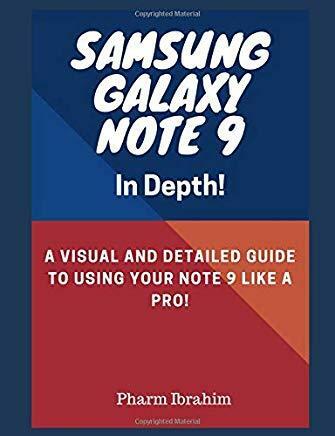 This guide is a splendid companion for Samsung Galaxy Note 9. This is a very thorough, no-nonsense guide, particularly very useful for the newbies. This guide contains a lot of information on Samsung Galaxy Note 9. It is full of actionable steps, hints, notes, screenshots and suggestions. This guide is particularly useful for newbies and seniors; nevertheless, I strongly believe that even the techy guys will find benefits reading it. In addition, when you buy this guide, you will have the access to ask me ANY question pertaining to this device by sending an email. Interestingly, you can expect to get a reply within one to two business days. Put simply, if you want to get the most out of your phone choose this guide. PS: Please make sure you do not give the gift of Samsung Galaxy Note 9 without giving this companion guide alongside with it. This guide makes your gift a complete one.